Pauline Manford's family is unhappy and falling apart in all kinds of ways, but she can't deal with reality and instead relies on a busy schedule of meaningless engagements, rest cures and a series of spiritual healers to fill the void of her days. Her greatest satisfaction is in spending ever more money on expanding and improving her home and gardens, paying the huge bills, and counting the money still in the bank. She's too "busy" to visit an acquaintance with cancer or talk to her ex-husband about an important matter and so enlists her daughter Nona to do so for her. Nona feels anxious and oppressed as though by the weight of everything her mother refuses to shoulder, and is unhappily pining away after a married man. Pauline's husband Dexter is tired of her superficial life and is drawn to his step-son's wife, Lita, which goes completely without notice by Pauline. Lita wants to run off and be in the movies, but Pauline seems to think she can be convinced she doesn't want to. Pauline believes that if she says everything is fine, it will surely be so. 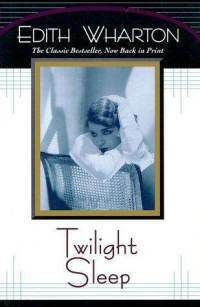 The phrase "twilight sleep" refers to an insensibility to pain without losing consciousness, and that is state that Pauline strives for. She does it without drugs, instead relying upon whatever dubious spiritual healer is currently in vogue, and her own vast powers of denial. She speaks at various charity engagements, not even realizing that the organizations she is supporting conflict with one another in their goals. Her friends are just as superficial and ridiculous as she is. One, Mrs. Landish, has become so obsessed with Vikings she has redone her house to reflect that style. She becomes upset when the rushes she wants to cover her floor with aren't available and she has to settle for commissioning handwoven rugs from Abyssinia. We can presume these efforts will all be for naught when Mrs. Landish discovers a new fad. This satirical novel about bored people filling their empty lives with meaningless activities - work, affairs, fake spirituality - was never very popular and from the reviews I've read, some people find it really dull but I didn't. The funny thing is that I read it YEARS ago and all I remembered was that I liked it. And that it had something to do with drugs. It has nothing to do with drugs, and much of it is so subtle that I'm surprised I liked it so much. But maybe I was just much more enthralled with the 20s than I am now (and I suspect my brain worked better in my youth.) I still liked it well enough, and I think it really does capture the era nicely. It's not especially well-known, but if you like the 1920s and/or Edith Wharton, I think it's required reading.